The 70,000 Character Petition (Tibetan: ཡིག་འབྲུ་ཁྲི་བདུན་གྱི་སྙན་ཞུ, translit. Yig 'bru khri bdun gyi snyan zhu (Wylie) (Chinese: 七万言书) is a document, dated 18 May 1962, written by the Tenth Panchen Lama and addressed to the Chinese government, denouncing abusive policies and actions of the People's Republic of China in Tibet. It remains the "most detailed and informed attack on China's policies in Tibet that would ever be written." The Tibetan Annals, or Old Tibetan Annals ("OTA"), are composed of two manuscripts written in Old Tibetan language found in the early 20th century in the "hidden library", the Mogao Grottoes near Dunhuang in northwestern Gansu province, Western China, which is believed to have been sealed in the 11th century CE. They form Tibet's earliest extant history. The Tibet Area was a province-level administrative division of the Republic of China and early People's Republic of China. The Panchen Lama (Tibetan: པན་ཆེན་བླ་མ, Wylie: pan chen bla ma) is a tulku of the Gelug school of Tibetan Buddhism. Panchen Lama is one of the most important figures in the Gelug tradition, with its spiritual authority second only to Dalai Lama. "Panchen" is an abbreviation of "Pandita" and "Chenpo", meaning "Great scholar". The Golden Urn refers to a method introduced by the Qing Empire in the late-18th century to select rinpoches, lamas and other high offices within Tibetan Buddhism. It was institutionalized in the 29-Article Ordinance for the More Effective Governing of Tibet. 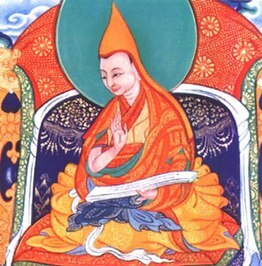 The Qianlong Emperor also published the article The Discourse of Lama in 1792 to explain the history of lamas and the reincarnation system, while also explaining why he thought it would be a fair system of choosing them, as opposed to choosing the Lama based on the advice of only a few. . The Battle of the Salween River was fought in September 1718 close to the Nagqu(i.e., Salween River) in Tibet, between an expedition of the Qing dynasty to Lhasa and a Dzungar Khanate force that blocked its path. The Yarlung Tsangpo Grand Canyon is the deepest canyon in the world, and longer than the Grand Canyon. ... that the Tibetan eared pheasant may be declining in number because there are insufficient places for it to roost? ... that Tibet's Moupin pika is a burrowing mammal that makes haypiles to store food? ... that the proposed Potala Tower in Seattle was named after the Potala Palace in Tibet by its developer, a former Tibetan Buddhist monk? ... that the Kangri Garpo mountain range contains the lowest-altitude glacier in Tibet? ... that Kunphela, a favorite personal attendant of the 13th Dalai Lama, was a co-founder of a political party that aimed to restructure Tibetan society through revolution? Do you have a question about Tibet that you can't find the answer to? For editor resources and to collaborate with other editors on improving Wikipedia's Tibet-related articles, see WikiProject Tibet. This page was last edited on 26 February 2019, at 23:12 (UTC).